PHUKET: Officials responded to complaints about a “dangerous and uneven” road after social media users posted pictures of Sakdidej Road in Wichit, urging authorities to take immediate action to fix it. The pictures were shared on a Facebook page titled Siang Prachachon Khon Phuket (‘The Voice of Phuket Citizens’). Frequent users of the road told the Phuket Gazette that it curves and dips in patches, making it dangerous to drive on, especially at night. Patiwetwottisak Sookhii, director of the Phuket Highways Office, said that renovation work was ongoing but riddled with problems. “A 50 million baht budget was approved to smooth out and widen the road. However, the renovation work has been sporadic. Each time we requested the amount approved in the budget, we were given funds in chunks of 10 or 20 million baht, which caused inevitable delays,” said Mr Patiwetwottisak. “Some parts of the road are uneven because of problems with site design and cars driving over patches of road that were in the process of being repaired,” he added. 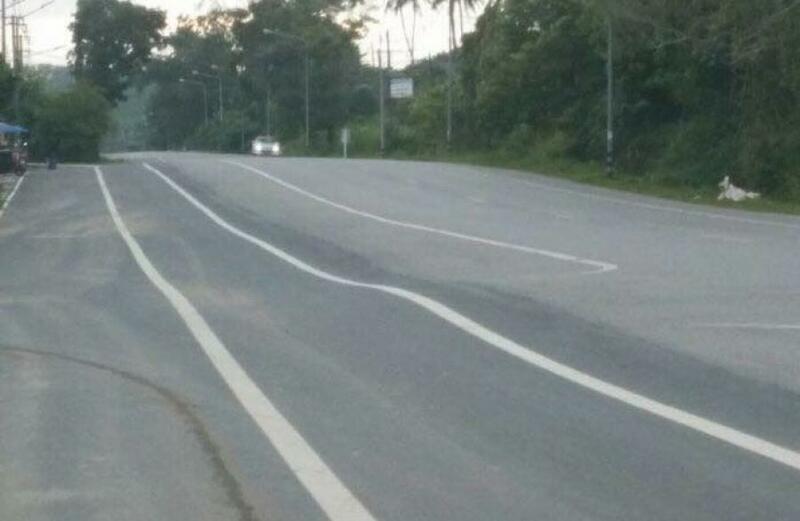 The Phuket Highways Office has now requested another 50 million baht to complete the project. Mr Patiwetwottisak said that part of the renovations would also include adding more streetlights to make the road easier to see at night. “If the budget is approved, we will repair this road by the end of this month. If not, we will have to present our case again and wait for the budget to be approved,” said Mr Patiwetwottisak.